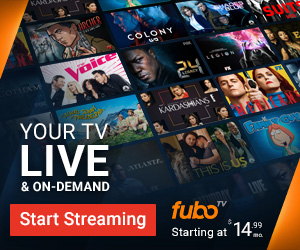 HUGE Month 1 Discount on Fubo! RVers. Marlan here. I can WHOLEHEARTEDLY recommend Fubo TV. You can find out on RV52 that I really don't want to be tied down to a geographic location – which is exactly what the phone companies and cable companies want to do to you. For me, in particular, I LOVE Nebraska University sports. Try watching that without a cable tv subscription. Try watching it with Sling. Until Fubo. I used Fubo, and I love it. My Cornhuskers didn't do so well, but I got to see them. And that is what counts.